Watch over 400 of the best social change documentaries free to watch online, all via one massive wall of films on a single page. One click beyond this magical wall of films, everything has been cataloged and sorted into 42 different learning themes and is searchable and sortable by highest rated, most viewed, and newest added. Such an easy and page turning read! Clay Richter was walking home to his old farmstead for reasons not fully formulated or understood. Hurricane Sandy having just swept through and showing the thin facade of civility around him was just the tipping point. Thoughts of his wife and daughters haunt him. Others he meets along the way heading various directions helping him to hash out his thoughts and purpose. A simple walk to his farm..... turns into a life changing and life defining journey for us all. Lately, I don't get much reading time with my four small children, outside of their school books. But I found this story really drawing and every free moment that I had, I pulled it out, sunk in and enjoyed it. I can't WAIT to read the sequel, The Last Pilgrims (loosely the unofficial basis for Revolutions, I've heard ;) ). You can purchase W1CK, Kindle Edition for .99 from Amazon – Click Here! You can purchase The Last Pilgrims from Amazon too – Click Here! So heartbreaking to hear this father speak of his son's murder, and to acknowledge the part he played in it. He paid such a horrible price for such a common mistake. I weep to think of his pain and loss. While many point their fingers every which direction.... they ignore what this man knows. It was his responsibility to keep his son safe. And he didn't. I do not give a free pass to the people who committed these murders. And I do not want to cause any more grief for parents who have suffered such horrendous loss. But, ultimately the responsibility for our children's well being falls to us, the parents. They are given to us by God with strict instructions, to teach them (Exodus 18:20, Deuteronomy 6:7), love them (Titus 2:4), comfort them (1 Thessalonians 2:11).... and protect (Esther 8:11) them. But society tells us that isn't 'normal' or in the 'best interests of the child.' Instead we are told to ship them off daily to a local government run facility where licensed educators will teach them approved humanistic curricula, track their progress and judge their ability to function in society when they become adults. I cannot endorse the call to keep prayer and bible reading in school. They have no business teaching my child how to pray and to whom. They have no business promoting one religion or any.... And I include atheism in this, as it is a belief regarding a higher power, that being none, and secular humanism, being the worship of the human being. I would not want them teaching Islam, Buddhism or any of the numerous and very different denominations of Christianity. I cannot endorse having the schools monitored by armed guards and metal detectors, subject to invasive searches and seizures at whim. I do not want my children to be forced into what equals an occupied ghetto daily, laying down any sense of freedom and security each time they head to school. I cannot endorse the call take away the rights of gun owners across America. Gun owners across America did not wrong me or these little ones. Each man is guilty of his own crime. And I do not want millions across America to be as defenseless as these children were in the face of evil. Evil won't be stopped by gun laws and will, in fact, become more rampant and brazen in the wake of disarmament of their victims. Why don't you homeschool your children? Maybe it isn't 'free' like public school. The costs of homeschooling vary from family to family, ranging from complete free curriculum to several hundred dollar packages per grade level. You can find something that will work for your family and budget. I would gladly help anyone with questions and most homeschoolers would be as well. Maybe it isn't as 'easy' as shuffling them off on the school bus in the morning. But I get to sleep in until 7 or 8 most mornings and can accomplish our 'schooling' while in my pj's before noon most days. Maybe it isn't 'convenient' like having a babysitter every weekday from 8-3 while you have that second income, or free time for personal endeavors. I choose to enjoy every moment with my children. I don't really have 'personal projects' right now. Instead we have 'family projects' which can be turned into educational experiences usually. Sewing, Canning, Chicken Raising, Blogging.... all educational experiences. What are you willing to do to ensure the success and security of your children? How many of Columbine's or Sandy Hook's parents wish they had considered that option just one more time? La Soñador ~: Why Do I Homeschool? - Many times I have been asked, "Why do you homeschool?" I understand that for many, the thought of homeschooling their children never occurred to them. Public schooling is so normalized, so convenient, so status quo. La Soñador ~: Aleksandr Solzhenitsyn - A Man Who Refused To Go ... - To learn more about Alexandr Solzhenitsyn You can start here http://en.wikipedia.org/wiki/Aleksandr_Solzhenitsyn. ‎"I do not carry a firearm because it is my right. I do not carry because I am afraid. I do not carry because I am paranoid, and I don't carry because I am trying to make a statement. I am not being political, and I am not being religious. I do not carry a gun because I want to frighten, intimidate, or kill. I carry a gun because there is genuine evil in this world. I carry a gun because most people are not equipped to deal with that evil. I carry a gun because the police mostly respond to crime, they do not prevent it. I carry a gun because there are some that can not defend themselves. Some threats are too fearsome, too strong, and too evil. I carry a gun because I am willing to stand between you and that evil. I carry a gun, expecting that someday I may have to use it, and praying that I will never have to." As I read the story of the Tower of Babel, I must admit.... I don't really understand it. I do not read any clear explanation as to why it was 'wrong' to build the tower. I do not know exactly what God was so concerned about. Honestly, it isn't like they would actually get that tower built up to heaven and storm the gates. I do however notice some real similarities between those who built the Tower of Babel, and those who are 'building' our society today. All the people gathered together to dwell in one place, the valley of Shinar, to build their city and the infamous tower. While there are now 7 billionish people in the world today, a majority of them have gathered together into the cities. All the people spoke one language and joined together to accomplish their goal. The world population today speaks many languages, but we are moving closer and closer to having a global economy, a global government and very likely some manner of a global language or even Babelfish to translate anything on the spot for clearer communication. And.... perhaps this is the real crux of the matter.... all the people were doing what they 'the people' wanted. The world today is full of people who do what they 'the people' want. They are not concerned with what God wants. The people, then and now, are concerned with only their own desires and wishes. They join together for a sense of security, they build systems that depend on each other for their needs. And they 'forget' the Lord. Each family no longer grows their own food, depending on the Lord for the rains in their season, no longer working the land to build fertile and healthy soil. They now go to grocery stores, stocked by menial laborers, supplied by lowly transporters, from subsidized, mono-culture, genetically modified, pesticide laden farms. Each family no longer maintains their own health, relying on the biblical values of healthy living, working for your food, using the God given medicinal herbs, and believing in the word when it says, "Is anyone among you sick? Let him call for the elders of the church, and let them pray over him, anointing him with oil in the name of the Lord," in James 5:14. They now go and pour out money to men with the titles of "Doctor" and "Pharmacist" and fill their bellies with pharmacological potions and chemicals with more side effects than benefits. Each family no longer works for their own at all. Each man and woman is expected to leave the home most days and labor in those menial service jobs around their cities, and earning fake money printed on paper, which they need to buy all those meaningless trinkets and entertainments advertised on any and every surface. Each child is expected to attend public, government schools, learning how to be the next generation of good drones that never question the status quo but continue to slave away for mammon. I think... perhaps the Tower of Babel was not in itself the problem at all. But the hearts of the people, which were turned in ANY direction but towards HIM. The good news today is.... It is not too late.... RETURN TO HIM! COME OUT OF BABYLON! COME OUT!! And here we see the BEAUTIFUL promise for those that return to Him. 30 “Now it shall come to pass, when all these things come upon you, the blessing and the curse which I have set before you, and you call them to mind among all the nations where the Lord your God drives you, 2 and you return to the Lord your God and obey His voice, according to all that I command you today, you and your children, with all your heart and with all your soul, 3 that the Lord your God will bring you back from captivity, and have compassion on you, and gather you again from all the nations where the Lord your God has scattered you. 4 If any of you are driven out to the farthest parts under heaven, from there the Lord your God will gather you, and from there He will bring you. 5 Then the Lord your God will bring you to the land which your fathers possessed, and you shall possess it. He will prosper you and multiply you more than your fathers. 6 And the Lord your God will circumcise your heart and the heart of your descendants, to love the Lord your God with all your heart and with all your soul, that you may live. 11 “For this commandment which I command you today is not too mysterious for you, nor is it far off. 12 It is not in heaven, that you should say, ‘Who will ascend into heaven for us and bring it to us, that we may hear it and do it?’ 13 Nor is it beyond the sea, that you should say, ‘Who will go over the sea for us and bring it to us, that we may hear it and do it?’ 14 But the word is very near you, in your mouth and in your heart, that you may do it. Thank you to We Home School for sharing this poem. It can seem quite tedious when reading the generations of so and so, begat so and so, begat so and so. Many times you may feel the urge to skip these sections, and bemoan that they are in the bible at all. After all, "What do these people mean to me?" Of course, you may not realize it... but in that question is an amazing answer. They may mean nothing at all to you. But to God.... they mean something. They mean a lot. You see.... as you live out your life here on earth, day by day, hour by hour, sometimes, minute by excruciating minute, your every prayer is heard, your every breath numbered, and your every tear collected. God knows you intimately. And He loves you enough to die to be with you. And God knew each and every single one of these so and so's as well. Those names are written in the scriptures because He knew them, their daily struggles, successes, prayers and dreams. While the bible includes only the names of the firstborn sons for the most part, we should also remember that these sons grew into men, had wives, and many children whose names are not known to us. These generations passed before the eyes of the Lord. Mothers praying for their babies to be born healthy and strong, fathers praying for the Lord to help them teach these wild, bright eyed children, young girls praying for a good man to marry them, young men praying for the Lord to provide for his growing family. And that is really what the word is telling us when He lists the generations. 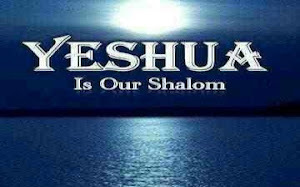 Remember He is sometimes called the God of Abraham, Isaac and Jacob? Yahveh is a God of FAMILY! Just as He calls us to be HIS children, He also shows us a mighty circle of Love in the Family Unit. The man loves the woman, who loves the baby, who loves the woman, who loves the man. Add a child, and the love grows. Add the children's children, and the love grows. Consider your own family. Your babies are precious to you. Your parents (I understand there can be exceptions) are loved by you, and love you. Your grandparents are loved by you, and they also love you. Before them, their parents loved them. Each member hoping and dreaming, and hopefully, praying for each other. The love grows. Be comforted. God loves you and you are MUCH MORE than just a so and so to HIM. Since early summer our grocery budget has been close to nothing. At first this was quite depressing to me. Every evening as dinner approached I would stare in my pantry like I was utterly lost....which I was. Meals came together by prayer alone. I learned some really important things, about myself, food storage, and the providence of the lord during this time. At first, of course, I still made meals I was very familiar with. Breakfast consisted of oatmeal or eggs. Lunch and dinner was spaghetti, stir fry, burritos, chili or baked chicken. But it wasn't long before.... There were no more oats, no more tortillas, no more canned tomatoes or sauce, no more chicken. The hens stopped laying due to stress from raccoons. The garden did not produce much of anything. Then a dear neighbor began providing my family with milk! This was a huge blessing to us with our growing kiddoes. When we had excess, we tried our hand at farm cheese. It was a wonderful addition to our meals. I also began to glean. In my local area we have a great online tool, Freecycle. I was able to ask this local email group for unwanted fruits and veggies as the harvest season was coming to an end. I was able to get local apples from several different neighbors. And a large quantity of zucchini was added to our pantry. I learned a few years ago that zucchini lasts several months in storage as long as the skin is undamaged. So I did not hesitate to take as much zucchini as was offered. Besides, we LOVE zucchini! Due to the timing of my pregnancy I missed my opportunity to glean local pumpkins and walnuts which were also available. My mother in law hosted thanksgiving and gave us the left over turkey and carcass. We were able to get many quarts of rich, thick broth canned from this. When some grocery money was finally available my attitude towards shopping had changed drastically. Our diet has changed drastically. But I think we are moving in the right direction. Our meals are now more 'sustainable,' made from ingredients we can grow ourselves or get locally. And we are so much less dependent on grocery stores. While many families use 'meal planning' to make their grocery lists, I simply reassessed my food storage. What had we used up, and what did we need to maintain our nutritious and simple meals? Here are some recipes that we have learned to enjoy and now rely on. Grind wheat berries until desired consistency. I like little chunks, but my kids liked it smoother. Mix into 2 parts boiling milk and bring back to a boil until it is the desired thickness. As it cools it will thicken more. Season with desired spices and sweetener. Saute zucchini slices in butter. Add tomatoes if desired. Add salt and pepper. Serve with prepared rice. Mix 2tbsp yeast, 1/4 cup sugar, 1/3 cup oil, and 1 1/4 cups hot water. Let rest 15 mins. Add 1 1/2 tsp salt, and 3-4 cups flour. Knead. Form 12-15 balls as and place in greased pan. Bake 20 minutes at 400 degrees. This dough make delicious cinnamon rolls if you have sugar and cinnamon. I am now planting some herb and lettuce seeds in the hope of having a little indoor, winter garden. I eagerly look forward to next years growing season. In conclusion, I am grateful for this opportunity to learn to feed my family without depending on the grocery store. Consider your habits and supplies now, while you can. Consider how you will feed and care for yourself and loved ones, in the event that the grocery store is simply not an option. 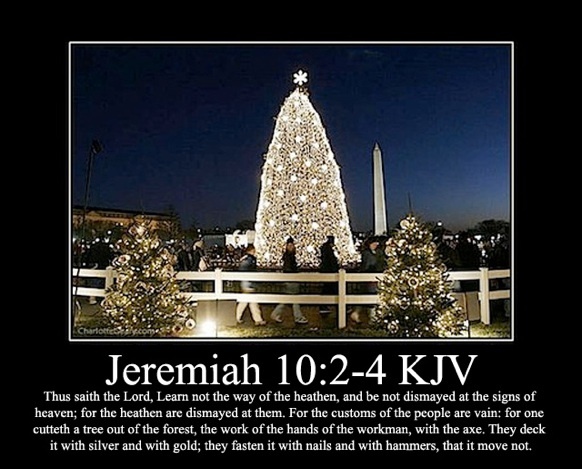 Why Would A Christian Say No To Christmas? And I did love Christmas. I loved the lights, the pretty ribbons and glass baubles, the music, the movies, and yes....the gift giving and receiving. But God said, "Now leave me alone so that my anger may burn against them and that I may destroy them." Why? What was He angry about??? To find out, you need to read the whole of Exodus 32. Most will be familiar with the basic story line. Moses went up the mountain to talk to God. People down below made a golden image, cavorted, feasted. But the point most miss is that they were trying to worship God. They had seen the ways that the Egyptians worshipped their gods and tried those methods to please their God. But it was detestable to Him. 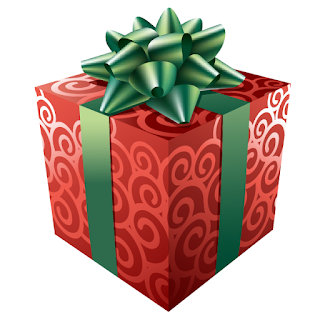 Christmas is built upon pagan deity worship and filled with pagan symbolism and practices. Most Christians are aware of this, and dismiss it, rationalizing that it doesn't have 'that meaning' to them, so God won't care. 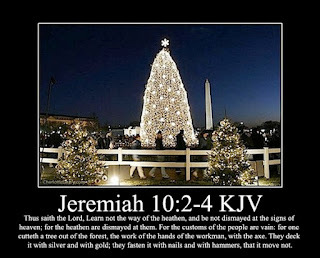 By researching Yule, you will find that the pagans keep this 'holiday' as well, with nearly exact trappings. Do you want to worship the Lord? Do you want to celebrate, feast, and revel in Him? I suggest you look into HIS feasts and holy days. After all, He freed the Israelites from slavery to Egypt to worship Him. And He freed us from slavery to sin to worship Him. We just need to find out what 'worship' is pleasing to Him first. I love history! And that makes the celebration of Hanukkah particularly exciting to me!! In reality, all the biblical feasts have such historical significance and a rich tapestry of meaning. But the history of Hanukkah, also known as the Feast of Dedication and the Festival of Lights, is particularly fascinating to me. The basic story is that around 167 BCE Antiochus was ruler over Israel. He replaced the High Priest, took the holy items from the temple and had swine sacrificed inside the temple, defiling it in an outrageous display of hatred towards the Israelites and their God. They proceeded in faith and prayer. Miraculously the oil burned for eight days, at which point they had new oil prepared for the temple. I encourage you to read the history from other sources, as I just skimmed the barest surface of it here. I was blessed to have sat in on a college lecture on this historical event and it is STILL vivid and amazing to me. It reminds me of two important lessons that Followers of Yeshua must build our lives upon. 1. Our worship of Yahweh is non-negotiable. WE must make it a priority. We also need to approach it THRU the Torah, to make a 'pleasing aroma' to Him. 2. When we proceed in faithful worship of Yahweh, HE will meet our needs. Such as the maidens who were waiting for their master's return. Five maidens let their wicks burn out and ran out of oil before he came, Five maidens kept their wicks low and had oil when he came. And the story of the widow who made bread for Elijah from her last bit of flour and oil. And the story of the prostitute who saved and saved to purchase costly oil, only to pour it out on Yeshua's feet. Oil is an integral part of life. We need fats regularly in our diets. It is a staple, albeit in small quantities, in many foods, such as bread and broth. It can be used to light and heat our homes. It can be used to power our vehicles. If we consider oil to be 'that which we need daily,' we can learn much from this story. We all need food and shelter. 1 Timothy 6:6-8 says, "Now godliness with contentment is great gain. For we brought nothing into this world, and it is certain we can carry nothing out. And having food and clothing, with these we shall be content." We all have concerns for our well being and future. Matthew 6:25-34 says, "Therefore I say to you, do not worry about your life, what you will eat or what you will drink; nor about your body, what you will put on. Is not life more than food and the body more than clothing? Look at the birds of the air, for they neither sow nor reap nor gather into barns; yet your heavenly Father feeds them. Are you not of more value than they? Which of you by worrying can add one cubit to his stature? “Therefore do not worry, saying, ‘What shall we eat?’ or ‘What shall we drink?’ or ‘What shall we wear?’ For after all these things the Gentiles seek. For your heavenly Father knows that you need all these things. But seek first the kingdom of God and His righteousness, and all these things shall be added to you. Therefore do not worry about tomorrow, for tomorrow will worry about its own things. Sufficient for the day is its own trouble." Mark 12:42-44 says, "Then one poor widow came and threw in two mites, which make a quadrans. So He called His disciples to Himself and said to them, “Assuredly, I say to you that this poor widow has put in more than all those who have given to the treasury; for they all put in out of their abundance, but she out of her poverty put in all that she had, her whole livelihood.”"
Matthew 25:21 says, "His lord said to him, ‘Well done, good and faithful servant; you were faithful over a few things, I will make you ruler over many things. Enter into the joy of your lord.’"
This year's Feast of Dedication begins this Saturday! God's Reward System - Did you know that God has a reward system? It isn't like He is some kind of arcade game, where you win points. It isn't like your credit card that gives you "money back" for certain purchases. Christians and the Torah - Since my family has chosen to celebrate the Feasts of the Lord and learn and follow the Torah, we have come against MANY nay sayers. Most of these are arguments arise from fellow christians.